Some of our members have received a Comparative Billing Report (CBR) from Medicare and others can access their own statistics upon request. In order to understand the significance of the statistics, an online webinar is available that explains what the numbers reflect. Requesting a CBR is not connected with and does not precipitate a probe, audit or other adverse action by Medicare. 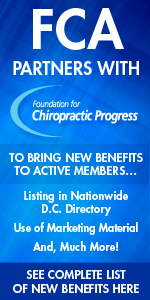 It is a tool to help chiropractors self evaluate their billing activities as it compares to all Florida chiropractors and all chiropractors nationwide within Medicare. Navigating the Medicare enrollment and revalidation process is among the top concerns voiced by FCA members who call FCA for assistance. Delays are commonplace and have extended to over a year in some instances. To assist members in reducing the delays, confusion and frustration, the FCA presents their third webinar available for members. It includes the more common and some less well known obstacles to getting the application completed correctly. One of the advantages of the webinar is the ability to pause it along the way to take notes or even go back: Highly recommended for anyone responsible for getting this job done. The FCA thanks Mollie Frawley, R.N., FCA Insurance Liaison and presenter in this webinar, for this outstanding webinar and for her constant and excellent service to members each and every day. And we acknowledge with appreciation the assistance of Dr. Sig Miller and ChiroView Presents for his role as moderator and with production. The FCA Insurance Office gets calls about many different subjects. Here are some Hotlines and Internet Links that may be very useful in your office, based on calls we have received.